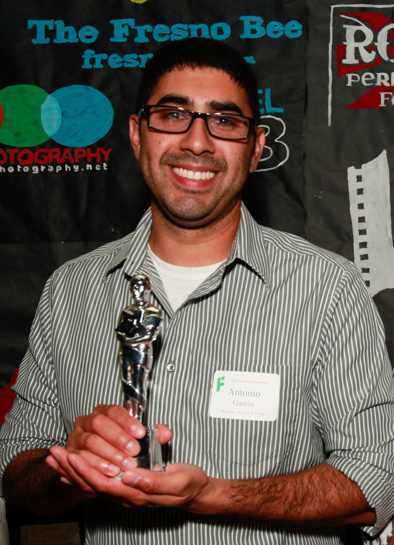 When he’s not turning in Oscar-worthy photo booth performances for Filmworks, our February 2014 volunteer of the month Antonio Garcia works as a solar system designer for RGS Energy. Occupation: Antonio works as a system designer for RGS Energy, a company that installs solar panels on homes. Filmworks thanks all of our February 2014 volunteers: Avigdar Adams, Jemimah Barba, Cleo Bauer, Leslie Bjerke, Lorna Bonyhadi, Micah Byers, Sadie Byers, Nené Casares, Antonio Garcia, Fae Giffen, Rebecca Horwitz, Carl Johnsen, Kathryn Johnsen, Monica Marks-Rea, Ann McGowan, Conde McGowan, Don Olson, Dominic Papagni, Shlomo Pleban, Sara Poss, Gene Richards, Susan Rogers, Bill Rovin, Abigail Smurr, Zoe Smurr, Richard Stone, Jon Veinberg, Analise Villalobos (intern), Suzanne Watkins. Past volunteers of the month: January 2014: Fae Giffen • December 2013: Cleo Bauer and Dominic Papagni • November 2013: Kathryn and Carl Johnsen • October 2013: Linda Hernandez • September 2013: Susan Rogers • August 2013: Joan and Brijesh Sharma • July 2013: Jon Veinberg • June 2013: Richard Stone • May 2013: Sarah Nixon • April 2013: Alyssa Rendon • March 2013: Nené Casares.